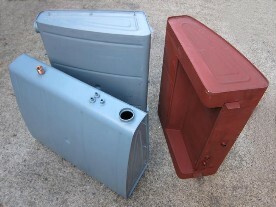 J2 (late round back type) and P Type petrol tanks available, complete with neck, breather and take-offs where appropriate. These are not the 20 gauge type but are made in a thicker 18 gauge and are usually in stock. Customers can also request changes to standard tank specifications, i.e. larger filler neck holes, telegage boss as per the J4 tank, or L2 specification etc although these will be made to order and a deposit will be required. Helpful Tip: over time tanks wear thin and one solution has been to internally line the tank with a suitable slosh tank sealant. These products were available prior to the introduction of unleaded petrol and were not compatible with each other. Sealants were modified for the new fuel at the time. A similar problem is now occuring with the current introduction of ethanol-blended fuels which are becoming more widespread throughout the UK and should ideally be avoided for use in our cars. It has now been found that these latest additives are attacking tank sealants and create engine failure. Careful thought should therefore be given when considering the benefits of repairing an old tank against a new replacement. Vintage MG Parts try to keep ahead of change when manufacturing parts hence our water jacket gaskets are made from an ethanol resistant nitrile rubber compound. Tanks are also available in Stainless Steel (price on application).